The 2012 AD Russia Party was held on August 29th at the Moscow Metropol Hotel. Lesjöfors Russia Managing Director, Konstantin Breze, was presented with an award for ‘Best Order Processing' by AD Russia MD Gennady Korolkov, beating off stiff competition from some well-respected suppliers nominated in the same category. 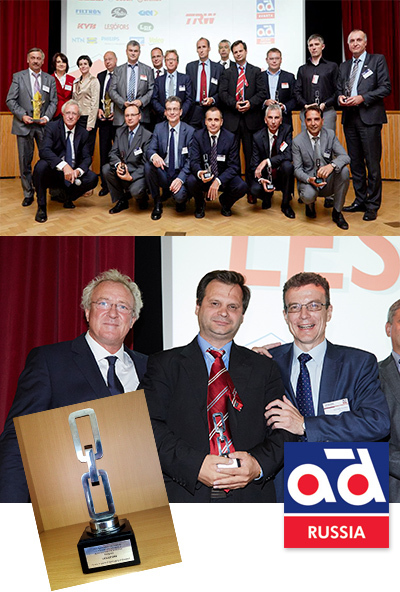 This award recognises the accuracy, speed and professionalism of the Lesjöfors supply chain. Making this achievement even more significant is the fact that Lesjöfors Russia has been operational for less than 2 years. Robert Glynn, Sales Director for Lesjöfors' Automotive Aftermarket division, said: "This award is well earned and a real reflection of the hard work of all our team in Russia"